The discovery of gold drew HJ Johnstone to Melbourne in 1853, but after prospecting unsuccessfully he established Melbourne's leading photographic studio in 1864. 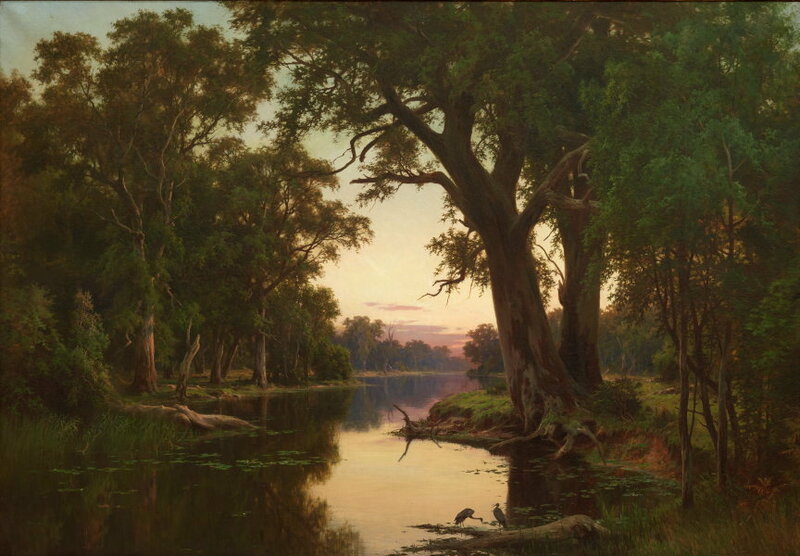 Having studied art as a young man in England, in 1867 Johnstone joined Louis Buvelot's painting school, and in 1871 was one of the first members of the newly formed Victorian Academy of the Arts. 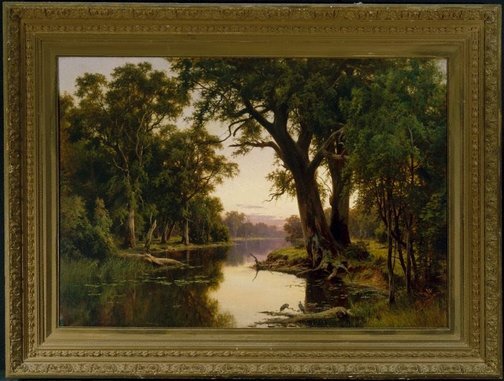 After his return to London in 1880, Johnstone produced a number of Australian landscapes from his black-and-white photographs, including 'A billabong of the Goulburn, Victoria'. This painting's tranquil and timeless landscape evokes a sense of nostalgia and melancholy. The unearthly stillness of the scene reflects the camera's ability to freeze time, and the artist's precision and attention to detail. Signed and dated l.r., oil "H. J. Johnstone 1884". Sarah Couper, Look , 'A place where storie are found', pg. 34-35, Sydney, Jun 2015, 35. Anne Gray, Sydney Long: the spirit of the land , 'The mysterious Mr Long', pg. 15-41, Canberra, 2012, 16 (colour illus. ).